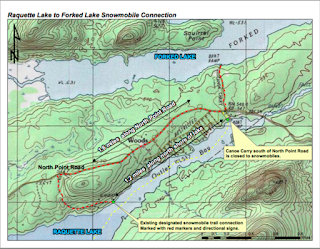 The Department of Environmental Conservation (DEC) announced that snowmobiles can no longer travel on the Raquette Lake Canoe Carry trail between Outlet Bay of Raquette Lake and North Point Road, which is on a private driveway and private road. The DEC only has a deeded right away for non-motorized public use. Any snowmobilers traveling between Raquette Lake and Forked Lake in the Sargent Ponds Wild Forest must use the new designated snowmobile trail (see map) between Outlet Bay and the North Point Road located 1.2 miles west of the Raquette Lake Canoe Carry and 1.6 miles of North Point Road between the designated snowmobile trail and the Forked Lake Canoe Carry Road. 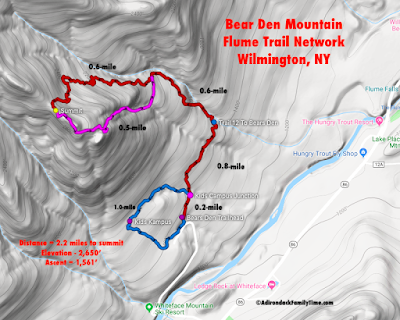 The new trail is marked with red markers and directional signs. The Forked Lake Canoe Carry Road between North Point Road and Forked Lake remains open to snowmobiles. Though the Raquette Lake Canoe Carry Trail had been used in the past for motorized use, any use was illegal. (The seasonal homes in the area were not used by their owners in the winter and the illegal activity was not reported.) Now homes in the area are occupied year-round and the owners found snowmobile use of the canoe carry trail disruptive. DEC and the Town of Long Lake agree that snowmobiles should not use the canoe carry trail and will direct snowmobilers to use the designated snowmobile trail and North Point Road according to the map above.